March was a rollar coaster month. Early on we made some changes to the team when the Jackets traded Dalton Prout to the Devils for Kyle Quincey. Then we started playing some amazing shutout games by Bob. He held tight for over 180 minutes and was named the 2nd NHL Star of the Week. During Game 66 of the season against the Sabres, the Jackets earned their 43rd victory of the season, to tie our franchise season record (set in 2013-14). It was during this game that Zach Werenski also earned his 40th point of the season to break the Blue Jackets record for rookie scoring. The record was formerly held by past Jacket: Rick Nash in 02-03. It took Werenski 8 less games than Nash to achieve this milestone. By mid March we were playing in a great groove, and we had some extra people to celebrate in the Blue Jackets family beyond just our on ice players. On March 16th, Jeff Rimer (our play-by-play announcer) was honored before play began for his achievement of calling 2,000 NHL games. Rimer is truly a gem, and I love listening to him and Jody Shelley spar back and forth during games. Fun fact: he was also a childhood friend of CBJ president of hockey operations, John Davidson. But in addition to our slew of new records (shutouts, single season victories, single season points, home ice wins), the CBJ have also had some injuries pile up. Atkinson was stepped on by Marcus Foligno (Nick's brother) on accident and had to get 17 stitched in his left shoulder. Thankfully there was no nerve damage and he didn’t get guillotined. Calvert and Sedlak were out for multiple games because of groin injuries. Murray broke his hand. Anderson, Werenski, and Bjorkstrand were out for a few games each after taking some hard hits on the ice. Here is the big news though: on March 19th the Jackets clinched their spot in the 2017 Stanley Cup Playoffs. We had been battling hard all season and it was an amazing feeling to clinch our spot so quickly. This is the 3rd time in CBJ history that we have made it to the playoffs. But we have never won a series, so let’s aim at breaking that record okay! However, looking back since the 19th we've had a bad patch, to put it nicely. 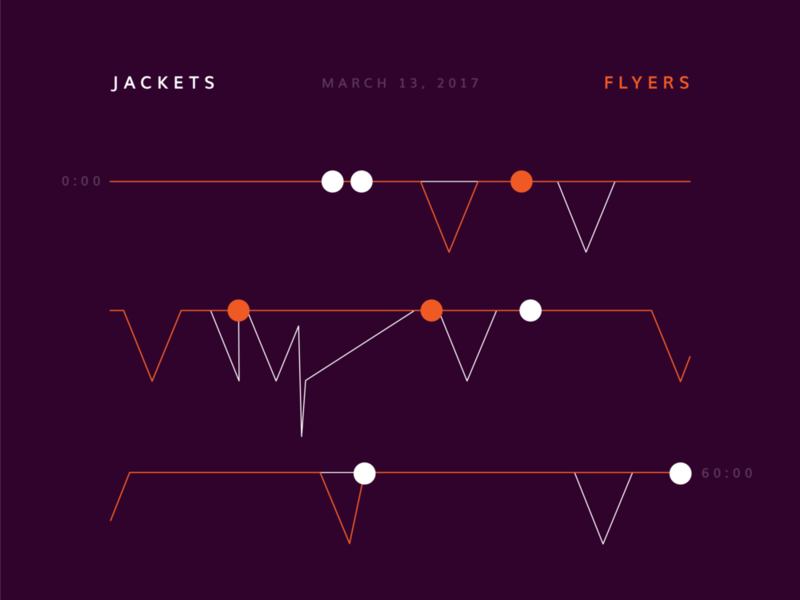 After a season of wins and a manageable scatter of losses, the Jackets started sliding downhill in a big way. The end of March and almost entire April was one loss after another. Previously, we hadn't lost more than 3 games in a row. But in the last 2 weeks of play we had racked up 6 consecutive losses and failed to score on 20 Power Play chances. That's a rough way to end such a great year, but luckily it's not over yet! The Jackets will be playing Pittsburgh on Wednesday, April 12th for Game 1 of their series. This is our opportunity to take the last few weeks of play and throw it out the window. We are a great team that symbolizes that underdog midwest spirit like none other. Yes we can stumble, and yet we have a long way to go. But we are the Columbus Blue Jackets and we are here to play our game. It has been a pleasure watching and visually chronicling this season's amazing story. 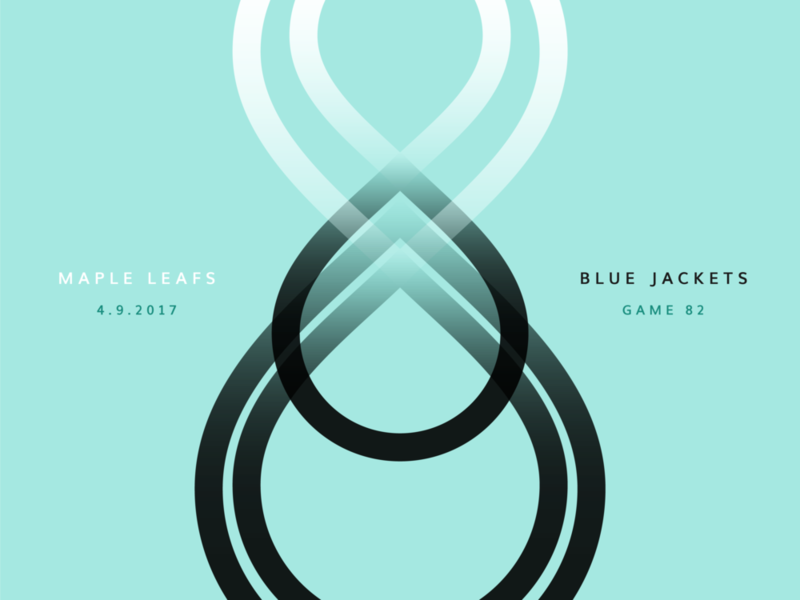 Although I hope I end this journey with a data visualization of our Stanley Cup victory, I have enjoyed every step with or without it. Let's go Jackets!